Gases rise from lava fissure 18 after it erupted early Sunday, May 13, 2018 near Pahoa, Hawaii. 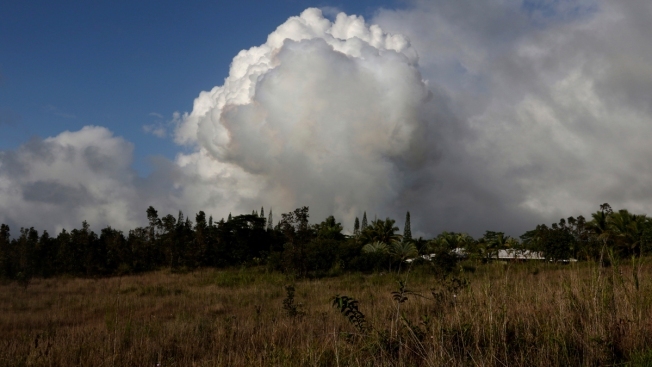 The new fissure emitting steam and lava spatter spurred Hawaii officials to call for more evacuations on Sunday as residents braced for an expected eruption from the Kilauea volcano. A new volcanic fissure on Hawaii's Big Island sent gases and lava exploding into the air, prompting officials to issue calls for more evacuations as residents awaited a possible major eruption at Kilauea volcano's summit. Hawaii County Civil Defense issued an emergency cellphone alert after the fissure was discovered early Sunday morning. The agency said one "unidentified structure" was destroyed by the new vent, bringing the total number of homes and other buildings lost to lava to nearly 40. Residents living near the fissure were told to evacuate, and two nearby community centers were serving as shelters for people and pets. Lava spread across hundreds of yards (meters) of private land and loud explosions rocked the neighborhood not far from the Leilani Estates subdivision, where more than a dozen other active vents opened over the past week. The new opening still showed signs of activity Sunday afternoon and was about 1,000 feet (300 meters) long, officials said. Few fissures, ground deformation and abundant volcanic gases indicate eruptions on the eastern flank of Kilauea are likely to continue, the U.S. Geological Survey's Hawaiian Volcano Observatory said. "In a way it's kind of exciting to see what's going on and be this close to it," Christian Ricks said. 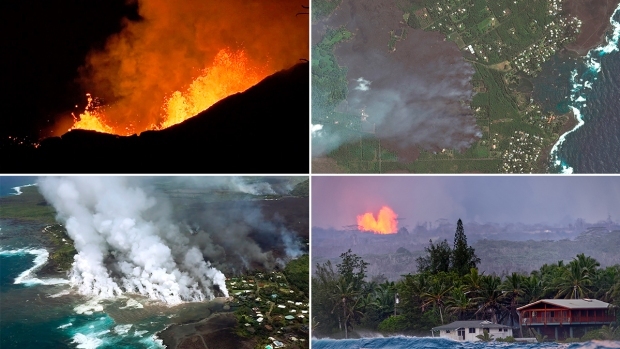 Most of the lava outbreaks have occurred in and around Leilani Estates, where molten rock has burst through the ground, destroying more than two dozen homes and resulting in evacuation orders for nearly 2,000 people. The Hawaiian Volcano Observatory reported the fissures opened just east of the Puna Geothermal Venture energy conversion plant, where steam and hot liquid are brought up through underground wells and the steam feeds a turbine generator to produce electricity. Plant workers last week as a precaution removed 50,000 gallons (189,265 liters) of a flammable liquid stored at the site.